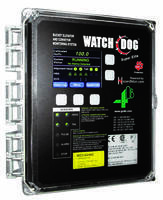 Watchdog™ Super Elite NTC & PLC Expansion Boards monitor bucket elevators. Processing signals of up to 27 sensors, WDC4 watchdog NTC & PLC Expansion Boards will log details when alarm condition is detected. Allowing up to 12 additional NTC inputs, system offers additional temperature monitoring. Providing 4 solid state relay outputs in PLC boards, unit monitors belt speed, belt misalignment, bearing temperature and plug indication. 4B Components Ltd., first introduced the Watchdog™ Super Elite monitoring system for bucket elevators and conveyors in February of this year. Today, 4B has extended the capabilities of the control unit with the introduction of NTC and PLC expansion boards. The NTC expansion board allows up to 12 additional NTC inputs to be added for additional temperature monitoring. The PLC board is a cost effective, basic programming card providing 4 solid state relay outputs for belt speed, belt misalignment, bearing temperature and plug indication. The Watchdog™ Super Elite (WDC4) is easy to install and simple to set-up. The system processes signals from up to 27 sensors* for belt speed, belt misalignment, continuous bearing temperature, pulley misalignment and plug conditions on bucket elevators or conveyors. When an alarm condition is detected the system will log the details, sound an alarm and provide shutdown control of the elevator/conveyor and feeding system. The Watchdog System is Class II dust hazard area approved by CSA/NRTL for use in Canada and the USA. Founded in 1971 as a subsidiary of The Braime Group, 4B has been an industry leader in developing high quality, innovative, and dependable material handling components for the agricultural and industrial sectors. 4B’s product line ranges from elevator buckets, elevator bolts and drop forged conveyor chain to level monitors, speed switches and hazard monitoring systems. With offices in North America, Europe, Asia, Africa and Australia along with a worldwide network of distributors, 4B can provide practical solutions for applications in any location.